In this season of employing our disposable income to honor friends, family and loved ones with gifts, there are several opportunities to use your holiday budget to promote good in our communities. Today, in Toronto, there is a social procurement event, where social enterprises and social purpose businesses are actively offering their wares to both consumer and corporate customers and there are presentations on how to incorporate social goods and services into business supply chains. This event serves as a good reminder of the power of social purchasing, whether at a corporate or personal level. There are many resources online to find that perfect socially responsible gift. You can visit Akcelos, which is a developing source for social enterprise links across the country. The Ottawa based Centre for Social Enterprise Development also hosts an online listing of Ottawa social enterprises. Social Enterprise Ontario also features a searchable online directory. And finally, join me and many others in person at HUB Ottawa on the evening of December 12 for the “Gifts that do Good” event. This is a free showcase, to be held from 6-9pm at 123 Slater Street, 6th floor. Click here for more details. Happy Holiday shopping, and on behalf of the many social enterprise vendors in Ottawa and across the country, I hope you find purpose in the meaningful gifts you give to others. UPDATE: CCEDNET has just released their list of BUY SOCIAL and BUY LOCAL links here. IMPACT HUB Ottawa is hosting a short workshop on theory of change and social impact measurement on October 17, 2018. It is only $10 to register, and the registration fee is donated to charity. Visit https://ottawa.impacthub.net/event/measuring-your-impact/ for more information. There is a new, heartening trend out there. Each day, we read (or hear second-hand) news that brings us tales of human injustices like murder, poverty, gender violence, and child abuse. This sad knowledge forms a foundation for the tide of details about accidents like plane crashes, natural disasters and floods. We are saddled with grief if we are feeling people, and we are labelled as ignorant if we ignore the obvious. The problem is the optimists. They are actually disproving the commonly held assertion that life is getting worse. The book Factfulness, by the late Hans Rosling and published by his family just this year, was my first introduction to rabidly optimistic views. And today I read “Are things getting better or worse,” an upsetting article written by Joshua Rothman in the New Yorker; it is upsetting in that it upsets the common beliefs of our collective pessimism. Rothman quotes content from scholars and experts around the world that further inform us that by virtually any standard, life is getting better for everyone on the planet. Life expectancy, murder, disease, abuse, addiction…you name it: the statistics in both the wealthy and the less wealthy parts of the world are staggeringly good. We are easily swayed by bad news. And increasingly we don’t hear the good news. But good news is all around us. Social enterprise is good news. It is not flawless, nor is it easy, but it is a positive tool about which we can all be optimistic. Imagine: businesses that exist only for the purpose of improving the lives, livelihoods and experiences of our people in our communities. It is my experience that social enterprise flourishes when social problems feel overwhelming. There are spectacular examples of social enterprise addressing the needs of communities in the North End of Winnipeg, the Downtown East Side in Vancouver, the impoverished areas of Nova Scotia, and many of the aspiring First Nation communities scattered across the country. I encourage you to visit the links page at the Social Enterprise Council of Canada, or visit Buy Social Canada, Social Enterprise Ontario, or the nascent Akcelos to see listings of social enterprises active in the market. Or read the many well researched reports that celebrate the impact of social enterprises at the Social Enterprise Sector Survey. Support social enterprises across the country as a customer. Learn about how social enterprises are changing the status quo for the better. Believe that even when there are challenges, there are innovative human solutions hard at work. Author Elisa Birnbaum is the editor and chief wordsmith on the active, informative and longstanding blog on social enterprise and the tools of social change in Canada: See Change Magazine. 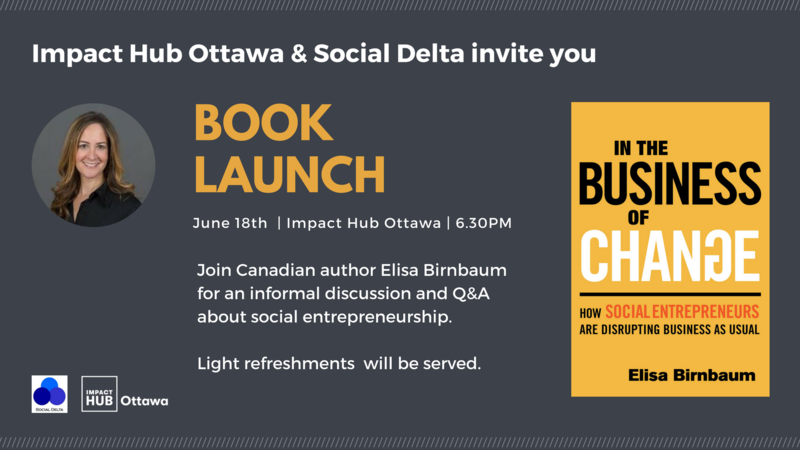 At the launch, Elisa will offer perspectives on what she has researched, stories about successes and challenges in the sector, and will bring to life some of the many significant changes that have been made by social enterprises in Canada, the US and across the world. She brings a warmth, honesty and tremendous perspective on this changing sector. Note that street parking downtown is also free in the evenings. There are a growing number of individuals who approach us here at Social Delta with a business idea that is going to make a social change through the sale of goods and/or services. Many of these prospective clients ask if it is necessary to hire professionals to help them launch their business correctly. Of course, we first assure them that hiring Social Delta would be a good choice to invest in professional guidance (offered half in jest, wholly in earnest). However, in full seriousness, Social Delta recommends that all starting entrepreneurs should hire the professional services of both a lawyer and an accountant. It is always our belief that social entrepreneurs should remain operating in the informal sector for as long as possible. However, once the business matures to the point where it is appropriate to incorporate as a formal legal entity, it is worth contacting a lawyer to help with the incorporation. It is not difficult to incorporate a business in Canada, but a lawyer can help you shape the language you use to help enshrine your social value proposition as a non-profit corporation, a co-operative, or as a private sector business. Good legal advice is not always cheap, but a one-time consultation can be cheap in the long run as it will inform you of your rights, obligations and the benefits of the various legal incorporation forms to host your social enterprise. Hiring an accountant early in your business operations will pay for itself many times over. As with the field of law, the field of accounting (and specifically tax codes) is perpetually changing, and getting good advice on how to set up your books, track your expenses, defer taxes, charge and claim GST or PST will make your first year of operations (and every year after) so much easier. What are the benefits and limitations of a sole proprietorship, a limited liability company, a multi-stakeholder co-op, or a non-profit? Should I incorporate federally or provincially? Is there hybrid legislation in my province, and if so, what should I be sure to include in my bylaws or articles of incorporation to assure that I could register as a hybrid company in the future? A qualified accountant who understands your business model will help you choose whether you want to take on debt, sell equities, or self-finance your new venture. Note that not all forms of financing are available in every form of incorporation. Furthermore, financing creates annual operational expenses, and professional advice on how to structure the contracts, loans, equity agreements, membership shares, or other forms of financing can help mitigate cash flow challenges. It is always a good idea to separate your personal and business finances. Have a separate bank account and a separate credit card to help track business expenses. Any accountant will likely tell you that, but they can also tell you what expenses you need to track. What do you need to capture for tax or other government reporting? What are the rules around entertainment and marketing expenses? What are some of the key financial performance indicates that I should be tracking regularly to ensure that the business is healthy? An accountant can help structure a business to determine how best to pay yourself. They can help structure the business to minimize income taxes and they can help plan HR costs to not jeopardize cash flow. Accountants understand the tax rules better than anyone else. Trying to stay on top of the changes to income tax, or the payment schedules of GST, or the charging of GST in different jurisdictions is not for the under-informed. Ask your accountant about how your status as a sole proprietor, shareholder, salaried employee, or contractor affects personal income taxes. If you have staff, how do you manage payroll taxes (and source deductions, for that matter). Accountants can help you determine eligibility for tax deductions and/or credits, and can help you determine when to charge GST and how best to set up the regular reporting and payment of GST to the government. When choosing how to incorporate your business, it is always good to consider what will happen when you aren’t there. You may want to sell the business, transfer the assets to a community organization, convert to a worker co-operative, or merge with another company. Social enterprises often seek to have an asset lock built into their initial design, in order that the business assets, intellectual property and staff remain in service to the community. Both accountants and lawyers will have advice on governance and processes to consider when you are downsizing, divesting, moving to another country, or merging with other legal entities. It is often said that entrepreneurs should understand all aspects of their business. I couldn’t agree more…the entrepreneur is responsible for product development, market research, financial oversight, sales, social impact measurement and everything in between. You have to understand it all. Entrepreneurship is often about juggling all the plates. Seeking professional assistance in areas of your business which require special skills is a wise investment of money to save you time, and can prevent future problems. Professionals can help you understand your business better, and make better choices. Social Delta advises that a modest investment early in financial planning and governance will likely prevent a potentially crippling legal or financial problem down the road. I am pleased to offer Impact HUB Ottawa members free consultations on social enterprise once a week during the fall of 2017. I will be at HUB Ottawa, 123 Slater Street, 6th Floor on Tuesday mornings from 9:30 to 10:30. Check the events page each week in case there is a last minute change in timing. Not a member of the HUB yet? Consider the Experts in Residence program as one of the many benefits of being a member, and drop by the space to chat with the host to ask about their very reasonable co-working rates. If you are at the HUB when I am there, and are interested in a chat about social enterprise, please feel free to come and find me if I’m not busy. If you are a social enterprise that hires individuals with mental illness, take advantage of this coupon offer by completing the online request form. This coupon offer is available to social enterprises in Canada that employ people living with mental illness. There is no deadline to complete the online request form but there are a limited number of coupons available in each category. Coupons will be distributed on a first come first serve basis to eligible applicants. The Social Enterprise Institute (SEI) was created to help anyone, regardless of location or economic ability, to set-up a social enterprise to address issues and causes they care about. SEI was also created to make learning easier to implement; to take the hassle out of learning new skills by delivering seamless, short, on-demand eLearning produced by industry professionals. Learn more about SEI at www.socialenterpriseinstitute.ca. SEI is one of the partners in the Social Enterprise Ecosystem project (S4ES). The S4ES project connects training, marketing, and impact measurement resources for social enterprises anywhere in Canada. The project is funded by the Mental Health Commission of Canada, the Government of Canada’s Social Development Partnerships Program, and the J.W. McConnell Family Foundation. Learn more about S4ES at www.s4es.ca. Social Delta is pleased to recommend the holiday gift guide that has been produced by Social Enterprise Ontario. Please consider supporting these businesses, as you share holiday cheer with friends, family and colleagues. Each gift you buy this holiday season can have significant impact on your community. Thanks to the newly launched Social Enterprise Gift Guide, extending the impact of your gift giving is now easier than ever. The Guide features a wide variety of products created by Canada’s diverse social enterprise sector, representing for-profit and non-profit organizations, cooperatives and B Corps. The Social Enterprise Gift Guide includes a broad range of products and is fully searchable by product type, price range, region and other categories. For example, you’ll be able to purchase calendars or greeting cards from Options Mississauga Print and Office Services, beer from Beau’s All Natural Brewing Company, meals cooked by Syrian refugees from Newcomer Kitchen, Inc. and order a gift basket of local preserves made by Youth Opportunities Unlimited in London. The Guide is available in English and French (ESontario.org). This project was made possible thanks to a collaboration of various community organizations and the financial support of the Government of Ontario. You can find the full catalogue of 100+ products and services online at http://seontario.org/social-enterprise-gift-guide-2016. Employment And Social Development of the Government of Canada recently launched two calls for proposals for innovative projects that aim to prevent and reduce homelessness. This is an excellent opportunity for social entrepreneurs with a social mission related to homelessness. The call for proposals for microgrants has been extended and will end on November 14, 2016. The call for proposals for microgrants – Apply for funding up to $25,000 for small-scale projects. Projects must focus on exploring effective and innovative practices, tools or initiatives that prevent or reduce homelessness in Canada. Note that there is also a more comprehensive funding program for larger scale initiatives, also with a deadline of November 14, 2016. For more information, please visit the Innovative Solutions to Homelessness funding page. As of April 2015, the Social Enterprise Council of Canada (SECC) has opened up its membership to social enterprises and any and all who support social enterprise across the country. By working together, we all have a greater voice to promote change. Become a member now and raise your voice to support the sector. The SECC is the only national organization that works to promote social enterprise policy and best practice. Based upon the following six pillars required to support the sector, the SECC has for almost a decade worked with governments, social enterprise supports, community partners, funders and financiers to help build a positive environment for social enterprise to start and flourish in Canada. These pillars have been used by public policy makers in BC, Nova Scotia, Ontario, Manitoba and in federal government departments. Annual memberships are inexpensive, and with greater membership, the Council has greater voice in representing those who are using business tools and earned income to create more just, sustainable, resilient and robust communities across the country. Join today at www.secouncil.ca. Become part of the conversation that will chart the future of social enterprise in Canada. Members are eligible to stand for and vote for SECC Directors–who are unpaid for their work to build the sector– and all members are invited to participate in the discussion on how best to support social enterprises in the country. One of the key public activities of the SECC is to work with a local partner to present a national conference every 18 months to showcase success, share best practices, build capacity and develop policy recommendations. Past conferences have been held in Vancouver, Toronto, Halifax, Calgary, and most recently in London (Ontario). The next national conference is planned for the Fall of 2016. Social Delta offers consulting services to individuals and organizations wishing to conceive, design, launch or expand a social enterprise. Our goal is to help our clients build community value through business activities. Our rates are reasonable, and we bring over a decade of experience to your social enterprise planning. We will work with you and your team of stakeholders to help your social enterprise survive and prosper through adolescence. If your financial picture needs a pick me up, or your social impact is not clear, we can help you identify concrete steps to reinvigorate and get your social enterprise back on track. Contact Us for more information and pricing. An ongoing venture or initiative that is primarily motivated by a social goal and seeks to maximize a positive social impact by selling a product or service in the marketplace. Social goals might include the employment of marginalized individuals, achievement of a social, cultural, recreational or environmental mission, or generating unrestricted earned revenue for a charity or non-profit. Social enterprises can be operated as sole proprietorships, companies, non-profits or co-operatives.